Earlier today the Bureau of Labor Statistics released their monthly Employment Situation Summary for December of 2011. The top line numbers are 200k new jobs and the unemployment rate of 8.5%. Those are good, but not great numbers. 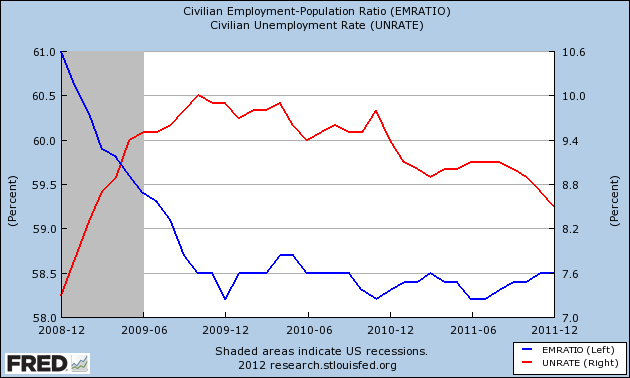 How can the unemployment rate decline while the ratio of employed people to the total population remains constant? This has to do with the formula used to calculate the unemployment rate. That rate is figured based on the number of people who are working versus the number of people looking for work. Those are the people who are considered employed or looking for work. But someone who's been looking for work for a long enough time is no longer considered "in the labor force." They are re-categorized as "marginally attached to the labor force" and, if their search for employment is unsuccessful for a long enough period, they will be re-categorized again as "discouraged workers." There were 2.5M people listed as marginally attached to the labor force. Of those, 945k were discouraged workers.